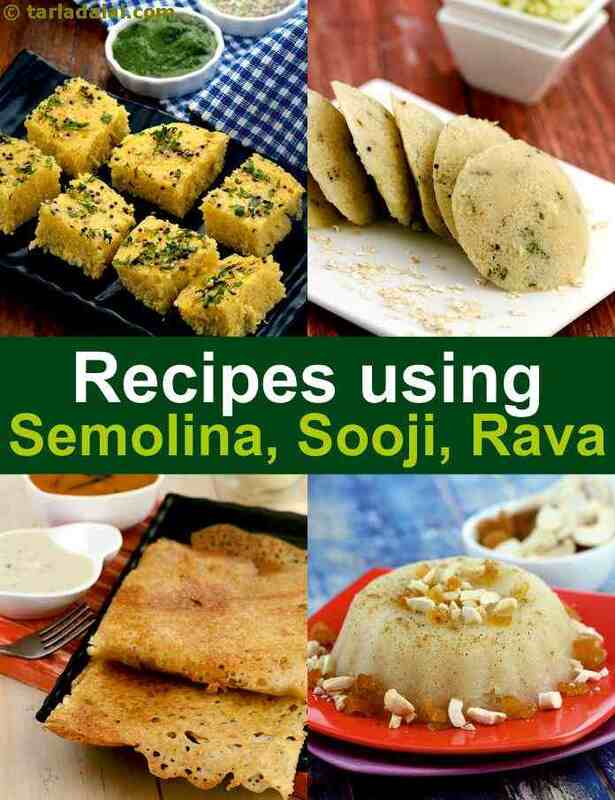 Semolina recipe collection. Semolina, also known as Rava or sooji, is a coarse flour that is made from Durum wheat and can vary in color from yellow to white depending on the quality of the wheat. Semolina is mainly used for making pasta, different kinds of cereals or desserts in USA and other countries but in India it is used mostly to make savoury dishes. Being one of the staples of Indian cuisine, it is not possible that we won't have innovative breakfast dishes made with it. If you want something quick and made in 10 minutes, there is Vegetable Upma which is basically just slow cooking the semolina with different vegetables in hot water, seasoned with asafoetida, mustard seeds and green chillies, till it cooks properly. If not upma, its also really good ingredient to make savory pancakes with like Rava Chilla, where the semolina is cooked like a pancake on a hot tava and is mixed with spices and finely chopped vegetables. If you are feeling up for making something healthy you can whip up these delicious Oats Rava Palak Dhokla, that will definitely win over your family and don’t even take too much time to make. Rava Dosa, made paper thin and instantly, goes very well with a coconut chutney and a side of sambhar. Rava Pongal is another great south-Indian dish to try that can be had as a breakfast. It consists of rava cooked with yellow moong dal and dry spices and will be liked by all. When cravings run high for something spicy, crispy and authentically Indian, Spicy Urad Dal Puris is the way to go, a fabulous snack to give you complete Rajasthani feels. The south Indians know how to use rava rightly with their absolutely delicious Instant Rava Appe with a tempering of mustard seeds and hing. Even the gujaratis love adding rava to their food, whether it is a simple Rava Dhokla or a besan and rava based super fluffy Khaman Dhokla. Rava works as a blank canvas and can be made into a savoury or a sweet item, how amazing is that! Our absolute favorite is the melt in the mouth Coconut Sheera with the nuttiness of coconut coming through on every bite you take and all its variations with different ingredients like the seasonal Mango Sheera or the ever favorite Pineapple Sheera. Another famous dessert is Karanji which is mostly made in Maharashtra, and is a deep fried delectable dessert with a coconut and rava filling. If you want to experiment, you can make Rava Cake that is so unique in itself that everyone will be surprised to see how delicious it tastes. Shahi Puran Poli, a sweet roti, grander than the regular sweet roti, with a stuffing of mawa, sugar and semolina is a superb Indian mithai designed to impress. There are so many different snacks to party starters that can be made with sooji. If you want something that will last a long time, Namak Para is the best of all. These deep fried diamond shaped pieces of dough made with maida and sooji will be finished in no time! If the purpose is to serve at party, then there is no better starter than Rava Dhokla with Stuffed Schezwan Filling. Rava is also used as a coating for a crispy other coating when deep frying any savory item like this cutlet made for a Cutlet Sandwich or the Baati for Daal Baati Churma. If you want to know more about the Uses of Semolina, then you can check out our article on that. Enjoy our Indian rava recipes below. A quick and simple snack option—you just need to soak the semolina for 30 minutes, and you’re all set to make pancakes without the hassles of grinding. I’ve added cabbage, carrot etc. To the semolina pancakes. You can feel free to add other grated veggies too, if you wish. Although very easy and fast, semolina pancakes are very nutritious too as they contain a bouquet of veggies like capsicum, carrots and cabbage, not to forget bean sprouts and spring onions. The crushed peanuts boost the flavour and texture of these pancakes.